You should all know by now that I love anything even remotely related to a heat pad! 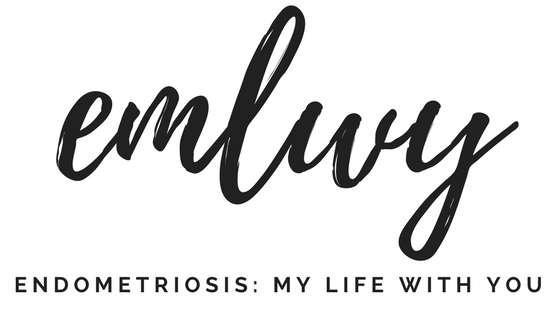 It's one of the most comforting feelings when you have any type of chronic pain and I've found it a great relief for my endometriosis and fibromyalgia pain. The good thing about heat, is that you can use it alongside any regular medication or therapy without it affecting those things. I was contacted by Healthyline to discuss not only their heat products, but also how they incorporate Far Infrared Rays (FIR), Pulsed Electromagnetic Field (PEMF) therapy, negative ions, photon light, hot stone and magnetic therapy in to them... And to offer you a cheeky 10% discount too! 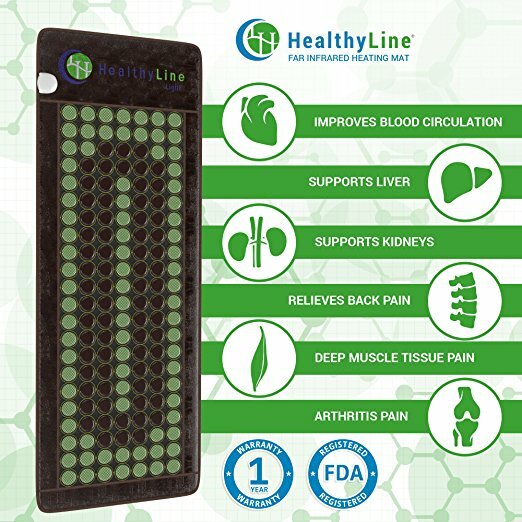 Healthyline manufacture the world's largest selection of heated natural gemstone therapy mats. Starting out in 2013 in New York (USA), Healthyline began as a collaboration between doctors, inventors, lawyers and entrepreneurs and quickly became an industry leader. They now work closely alongside doctors, acupuncturists, reiki masters, professional spas, wellness centres, holistic practitioners and more. In addition to mats, Healthyline also offer heated knee pads, shoulder pads, pillows and energy bedding. These products not only offer infra-red technology but also have the added benefits of negative ions and PEMF therapy. You can view Healthyline's full range of products here or their (.PDF) brochure here. 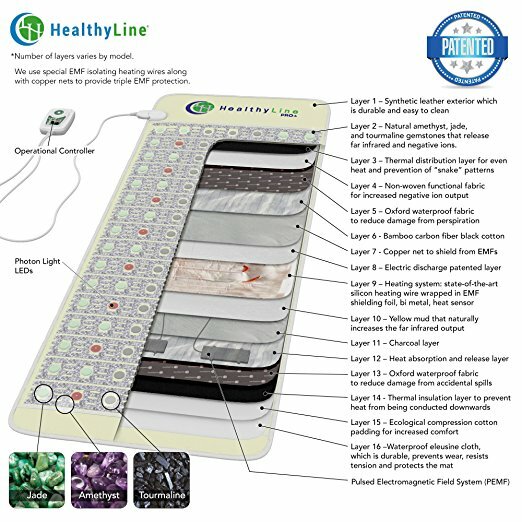 Healthyline's gemstone heat therapy mats are designed to facilitate proper functioning of the heat of a traditional heating pad and utilises gemstones to channel deep penetrating natural therapies that work together to provide one comprehensive experience, stimulating advanced natural healing of the body, leading to an increase in overall general well-being. Without the incorporation of natural gemstones, you would not receive the benefits of FIR or negative ions. Healthyline make many different models that include different variations of stones. Some consist of one stone, some a combination of two and then some use three or more. The more stones included in your model, the greater the range of benefits. 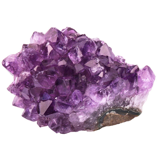 :: Amethyst is a natural conductor of FIR and negative ions. It is known to have calming and stress-reducing effects that make it ideal for meditation and calming practices. Amethyst has been known to enhance the body's ability to help with sleeping troubles, undergo detoxification and boost cell regeneration. :: Jade is made up of two components: jadeite and nephrite. Jade is a natural conductor of FIR and negative ions and is known to amplify the effects of other stones around it. It helps the body function more efficiently by restoring your energy and emits a low heat that is good for relaxation and meditation. Jade is often used as a treatment for kidney illnesses. :: Tourmaline is said to be a magical stone that protects those who covet its powers. It is known to help detoxify tissue and body systems. It emits FIR and produces the highest amount of negative ions out of all the gemstones Healthyline use. Tourmaline helps to revitalise the mind and body, speed up your healing functions, and aid in the regeneration of bone tissue. :: Obsidian doesn't produce FIR or negative ions but is a healing stone. The jet black colour of the stone is believed to draw all negativity to it, both physically and mentally, protecting the user from any harm. 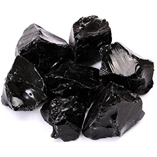 Obsidian is a very powerful support gemstone, amplifying the effects of other stones around it. FIR are invisible waves of energy that have the ability to penetrate all layers of the human body; deep in to tissues, muscles and bone. FIR are on the opposite side of the spectrum to harmful ultraviolet rays. The sun, our bodies and our hands are always emitting FIR. In the past, this discovery lead to healing methods like palm healing. This has evolved in to what is now known as Reiki, a form of healing that utilises the heat from the palms of the hands to assist in the body's natural healing process. Science has been able to focus the healing component of FIR and utilise these rays to improve our natural healing abilities. PEMF, also known as Low Field Magnetic Stimulation (LFMS), uses electromagnetic fields in an attempt to enhance your body's overall functioning as well as improving blood circulation, reducing chronic pain, promoting bone healing, alleviating symptoms of arthritis, treating symptoms of depression, increasing range of motion, and more. The process of receiving PEMF involves sending energy waves towards damaged and injured areas of the body. The waves pass through the injured areas and increase the spin of the electrons within them. As a result, the cell's potential is restored and improved healing can take place. Ions are invisible charged particles in the air - either molecules or atoms, which bear an electric charge. Some particles are positively charged and some are negatively charged. Positive ions are molecules that have lost one or more electrons, whereas negative ions are actually oxygen atoms with extra negatively charged electrons. Negative ions are abundant in nature, especially around waterfalls, by the sea, after a storm, in mountains and forests. The highest concentration of positive ions can be found in polluted cities, crowded areas and in confined spaces such as offices, industrial areas, schools and cars. Negative ions are beneficial for the human body and are scientifically tied to a lot of health benefits, whereas positive ions are harmful. Different body tissues absorb energy from different wavelengths of light energy. Unlike FIR, photon light therapy has a shorter wavelength so it doesn't penetrate as deeply. Photon therapy uses visible red lights at a wavelength of 660 nanometers. Photon light requires direct exposure to the skin in order for it's full effects to be received. When the photon light is absorbed by the body, it forms in to nitric oxide. This stimulates synthesis of adenosine triphosphate (ATP) which is essential for the metabolism of all cellular regeneration. Photon light therapy assists directly with the mitochondria, the part of the cell responsible for generating proteins and collagen. The new cells are able to destroy old cells, assisting even further with detoxification. Tourmaline, jade and amethyst are natural conductors of FIR and negative ions when they are activated by the heating technology. While you get all the typical healing experiences associated with hot stone therapy, these benefits are greatly amplified by the combination of these gemstones. Magnetic therapy is a science focused on maintaining the body's proper electromagnetic field to promote healing. When a magnet is placed on the body, it promotes increased blood circulation. This increased blood flow helps to deliver more nutrients to your body and flush out toxins and contaminants. The magnet also relaxes the surrounding muscles and tissues, enabling your body to heal more efficiently. Magnets offer a natural form of pain relief that can be used as frequently as required with no side effects. FIR stimulates the circulatory system, promoting increased oxygenation throughout the body. FIR can also help create white blood cells which improve your immune system and overall wellness. You may also find a decrease in stiffness and stress. Negative ions focus on the respiratory system and detoxification. They can help improve mood levels and generate more serotonin in the brain to facilitate sleep. Negative ions can help restore energy levels and help the body function more efficiently. PEMF initiates cellular revitalisation and helps maintain proper healing functions throughout the body. PEMF can alleviate painful symptoms of rheumatoid arthritis and increase the range of motion, reduce muscle spasms and neck pain in osteoarthritis patients. FIR can improve your sleep, reduce sleep disturbances and minimise aches and pains associated with chronic fatigue syndrome. FIR can also help create white blood cells which improve your immune system and overall wellness. Negative ions focus on the respiratory system and detoxification. They can help improve mood levels, generate more serotonin in the brain to facilitate sleep and restore energy levels. 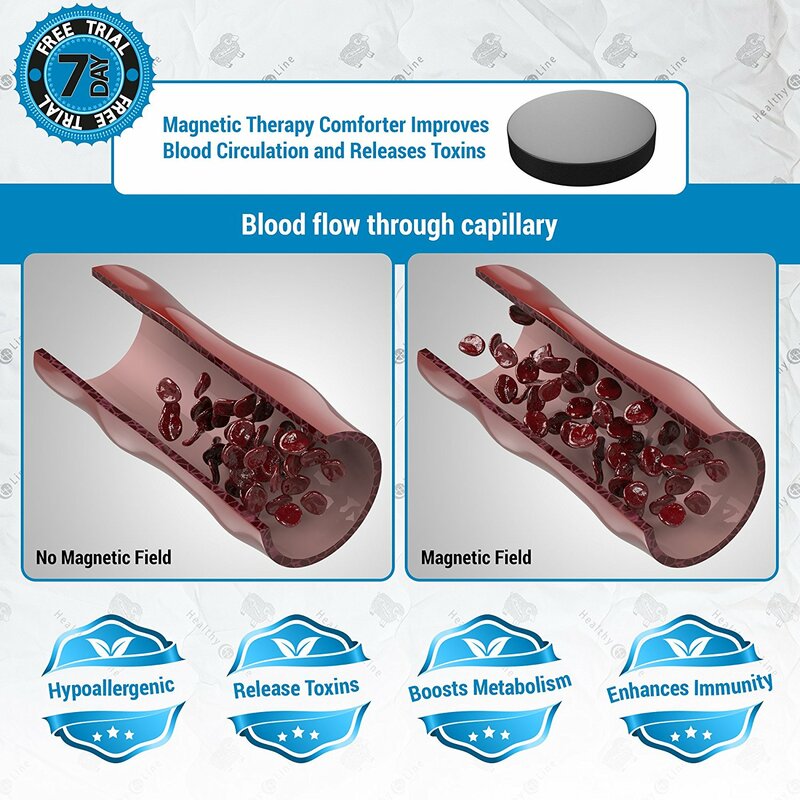 Magnetic therapy improves blood circulation. This helps to deliver more nutrients to your body and flush out toxins and contaminants. Magnetic therapy also relaxes muscles and tissue. The process stimulates melatonin in your brain, the hormone responsible for regulating sleep. FIR and negative ions increase blood flow, promoting oxygenation that improves blood pressure and the immune system. Negative ions will also improve your state of mind as a result of detoxification and increased serotonin levels. FIR and negative ions influence aspects of the body that are altered by fibromyalgia. PEMF can help those with fibromyalgia recover some of their body's natural ability to manage it's pain and relieve muscle tension. 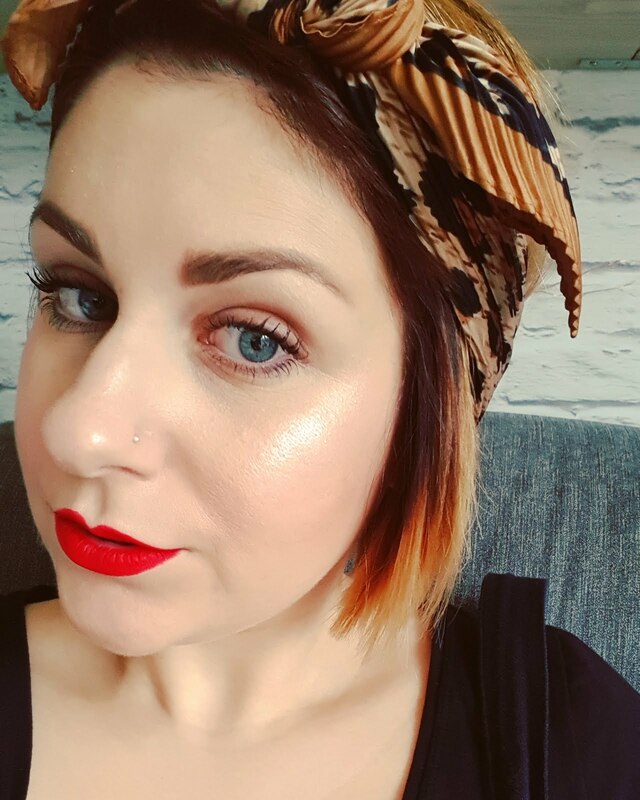 Photon light therapy aids fibromyalgia sufferers as it can relieve neuropathic pain and strengthen the immune system to help the body improve it's wellness. Fibromyalgia sufferers might notice a decrease in fibro-fog, a reduction in tense muscles, increased ability to get to sleep and a reduction in overall pain and swelling. :: ... And many more. If you are interested in any of Healthyline's products, then you can view their full range in their online store. Healthyline have also, very kindly, offered a 10% discount to you all. 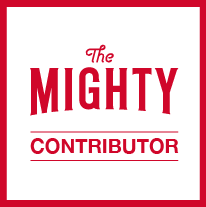 Just visit their online store and enter the code above at checkout! 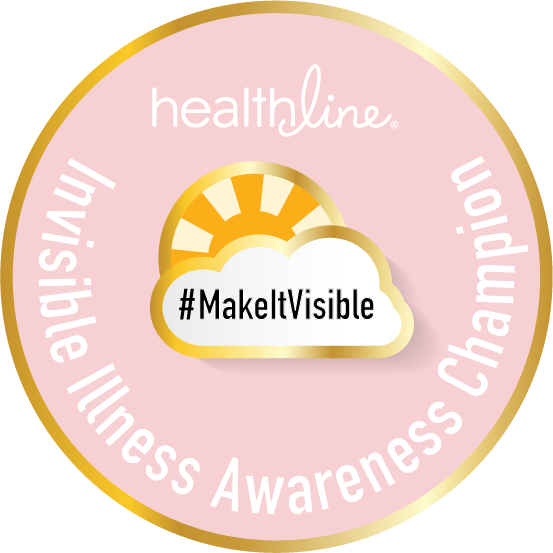 If you would like any further information, you can find Healthyline on Facebook, Twitter, Instagram and Youtube.